Low Profile Pedicure Stool w/ gas cylinder, casters ... the seat raises and lowers ... from 14" to 19" ... to accommodate different height pedicure systems. Choose from 4 popular QSE COLORS or custom-order your color for an additional 10%. Pedi-Stool w/ comfortably padded seat cushion, convenient drawer, premium casters. 16"W x 16"D x 16"H.
Standard QSE COLORS or custom-order your colors for an additional 10%. The Collins Pedi-Stool was designed to reduce stress in your shoulders and back and improve the overall comfort and efficiency of the person doing pedicures all day. Unit has a comfortable seat cushion, a correctly angled cushioned back, four casters, and two drawers for easy access to tools and supplies. Ask your distributor about the Pedi-Stool, only from Collins. 18"W x 16"D x 15 1/2" to surface of seat cushion. Unit arrives complete, no assembly required. Club Pedicure Ottoman, fully upholstered, w/ full-extension drawer & casters. Designed for Collins Club-Pedi, but works with most pedicure arrangements. CLUB PEDICURE Cigno Chair w/ FREE Footsie Bath ... use within minutes of delivery. Overall 27"W x 28"D x 22"H x 37"H.
22" from floor to seat cushion, 21" between the arms. Pull-out for foot spa extends an additional 20" from front of chair. This unit can be ordered with optional 10824 lumbar heat and three-zone-massage feature. CLUB PEDICURE Blush Chair w/ FREE Footsie Bath ... use within minutes of delivery! Overall 30"W x 34"D x 22"H x 38"H.
CLUB PEDICURE Nouveau Chair w/ FREE Footsie Bath ... use within minutes of delivery! Overall 28"W x 30"D x 22"H x 37"H.
Cigno Pedicure with an ACRYLIC WHIRLPOOL TUB. Includes pump, motor, four whirlpool jets, return, on/off controls, air-mixture control, built-in vacuum breaker, whiz spray for clean up, and patented FILL-FLUSH sanitizing system. Same unit w/ STAINLESS STEEL SOAKING basin, fixtures w/ whiz-spray for easy clean-up, drain assembly w/ control. This version has no motor, no pump, no electric, no maintenance, no pipes, and no sanitation concerns. The swiveling chair can be ordered with optional lumbar heat and three-zone-massage feature. Kelsey Pedicure Unit w/ ACRYLIC WHIRLPOOL TUB. 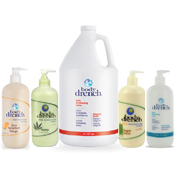 Includes pump, motor, four whirlpool jets, return, on/off controls, air-mixture control, built-in vacuum breaker, whiz spray for clean up, and patented FILL-FLUSH sanitizing system. Sink in black. Unit complies with local plumbing codes, including the states of California and Wisconsin. Same unit w/ STAINLESS STEEL soaking basin, fixtures w/ spray hose for easy clean-up, drain assembly w/ control. This version has no motor, no pump, no electric, no maintenance, no pipes, and no sanitation issues. Both versions include the quilted Kelsey upholstery, 10" entry/exit step with safety tread and utility drawer, and convenient cabinet storage for supplies. Overall, both measure 48"W x 52"D.
Choose standardQSE COLORS or custom-order your colors for an additional 10%. Cameo Pedicure w/ stainless steel SOAKING basin, fixtures w/ spray hose for easy clean-up, drain assembly w/ control. Unit has no motor, no pump, no electric, no maintenance, no pipes, and no sanitation issues. Includes twin 10" steps with safety tread. This unit can be ordered with optional 10824 lumbar-heat and three-zone-massage feature. 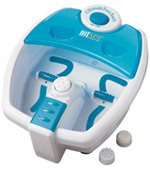 Footise Bath foot spa with heat, vibration, and 10 disposable liners. 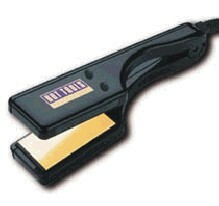 Four-position control, heat control, retractable 7' cord, 110 volts. Black only. Overall 14" x 15" x 9" high. The interior is 11" x 13" x 6" deep. Footsie Bath Disposable Liners, package of 100 liners, shown bottom right. "Footsie Bath Foot Spa w/ heat, vibration, & 10 disposable liners"
Patented & only from Collins - Task chair, portable nail table, and portable pedicure stool all in one! Fold out-of-the-way table top, padded upholstered rest, removable upholstered footpad for pedicure, five inch height adjustment, die-cast aluminum base w/ casters.